Bonham’s pre-Christmas sale of fine books and manuscripts saw Britain’s most famous atlas bid to an astonishing £35,000. Although Speed published an acclaimed Historie of Great Britaine in 1611, his work as a historian is considered secondary to his map-making, of which his most important contribution is his town plans, many of which provide the first visual record of the British towns they depict. His great atlas, The Theatre of the Empire of Great Britaine, was published in 1611/1612 and contained the first set of county maps of England and Wales, as well as maps of Ireland and a general map of Scotland, which is dated 1612. The maps were printed from copper plates which had been engraved, in reverse, by Jodocus Hondius in his workshop in Amsterdam. 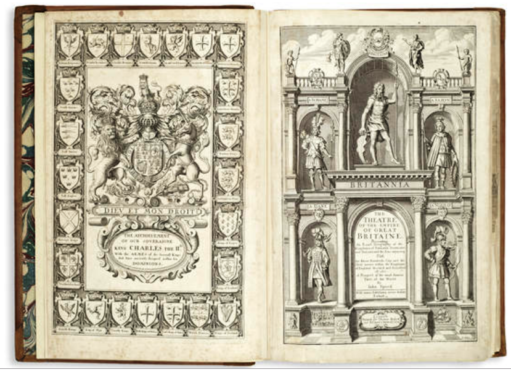 The Bonham’s edition from 1676 had 96 double-page engraved maps and five double-page letterpress distance tables. In this edition, The Prospect has seven maps which appear for the first time, including three of North America (New England and New York; Virginia and Maryland; Carolina). The copy showed a number of maps with repairs at margins, a small burn-hole to the map of Lancashire, tears on Berkshire and the Roman Empire and some trimmed edges – but otherwise it was a handsome 17th Century survivor, printed and bound in London by Thomas Bassett and Richard Chiswell. It was the most important and prestigious map of its day, with the 1676 edition widely regarded as the finest. Picture: Speed’s Theatre of the Empire of Great Britaine, £35,000 (Bonham’s).